Koine is Rita Marcotulli's second LP release following her earlier album The Light Side of the Moon which features a track made famous by Pink Floyd. Marcotulli is a jazz singer, pianist, and composer who always has a thread that connects her albums. Which explains why this album shares the title song ("Koine") with her prior album along with 10 more of her original compositions. 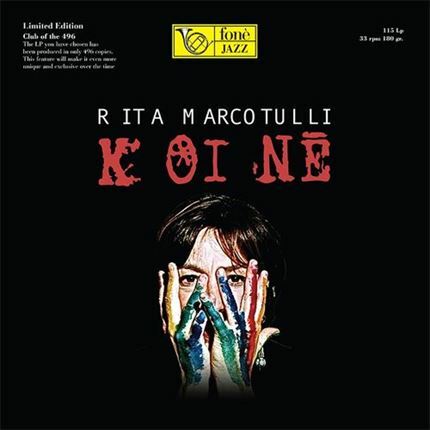 Playing piano from early childhood, Rita Marcotulli studied classical music at the Santa Cecilia Conservatory before being drawn to Brazilian music. She also began moving onto the fringes of jazz and established a local reputation at first, before becoming well known among contemporary jazz audiences both at home and abroad. This was largely due to playing with musicians such as Chet Baker, Richard Galliano, Jon Christensen, Palle Danielsson, Peter Erskine, Steve Grossman, Joe Henderson, Hélène La Barrière, Joe Lovano, Tony Oxley, Michel Portal, Enrico Rava, Michel Bénita, Aldo Romano and Kenny Wheeler. Marcotulli has claimed the influence of musicians such as Thelonious Monk, Bill Evans and John Coltrane. A highly skilled performer, she chooses to play in a style that derives as much from pop and folk as jazz. In addition to playing in jazz circles, Marcotulli has also composed music for the dance theatre and for films.